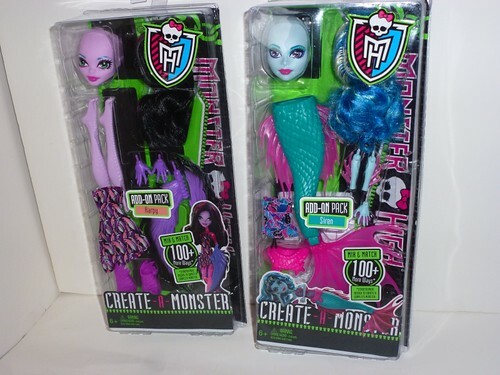 The latest release from the Monster High Create-a-Monster series includes Add-on Packs that (together with one or more Starter Packs) permit you to make a Siren or a Harpy. 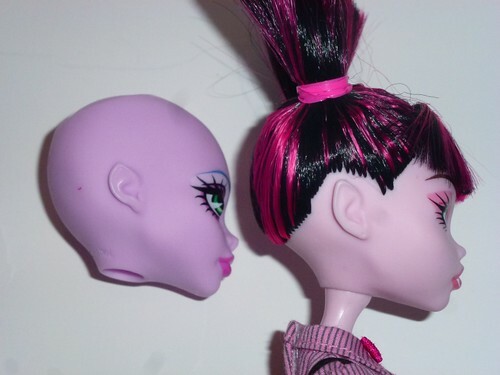 I’m a fan of mythological creatures from around the world, so it’s very exciting for me to see Monster High branching out like this, with so many unique body parts! The store I bought these at did not have the Ice/Blob or Mummy/Gorgon Starter Packs, alas. But I was so thrilled to find the Siren and the Harpy, it was hard for me to care too much. The Monster High Create a Monster dolls are a bit of a challenge for me sometimes. Although I think the mix-and-match aspect of the line is terrific, I always find that I want the bodies and limbs to look harmonious together. 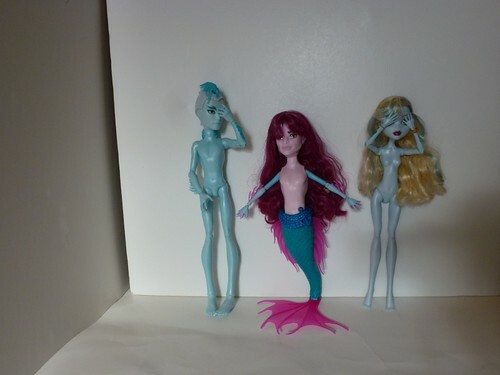 I was surprised and thrilled when Mattel released a 5-pack of torsos and upper limbs for their online store that matched the Three-Eyed Ghoul, Bee-Girl and Skeleton Girl. I feel like the Monster High Create a Monster Harpy is designed to teach me some kind of lesson about accepting the things that I can’t change. There is NO way for me to get a perfect match between the torso and limbs. First things first. 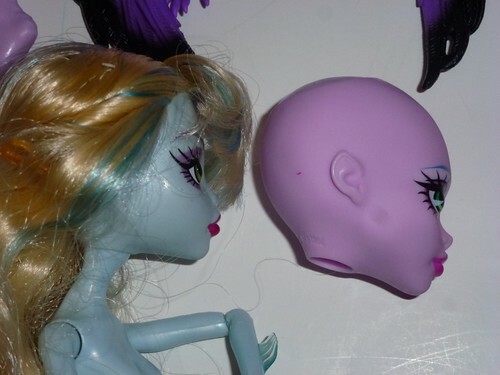 The Harpy has an pink head (different in shade and shape than the Create a Monster Vampire AND Draculaura). Her ears are pointed. She has impressively bulgy eyes rather reminiscent of a baby songbird. I don’t know if this was intentional or not, but it’s an interesting look. Here’s my first attempt at putting the Harpy together, using the body and limbs from the Sea Monster Starter Pack. I should note that the Harpy’s lower arms/wings and hands are made of a softer plastic, presumably for safety/breakage reasons. This makes them pretty heavy, and they also feel a little fragile to me, as if the posts might twist off if I wasn’t careful with them. I do love her little bird legs and birdie toes. Here’s my second attempt, using the body and limbs from the Vampire Starter Pack. In the end, I tried to mix and match. I’m still not really satisfied, and part of me wonders if I’d be better off using a totally different torso and upper-limbs so it wouldn’t look so awkwardly almost-matching. For some reason, none of the back-of-box photos show the Harpy girl’s shoes. They’re cute little open-toe pumps with a feather motif, and the heels are sculpted to look like dew-claws! On to the Siren Add-on Pack! 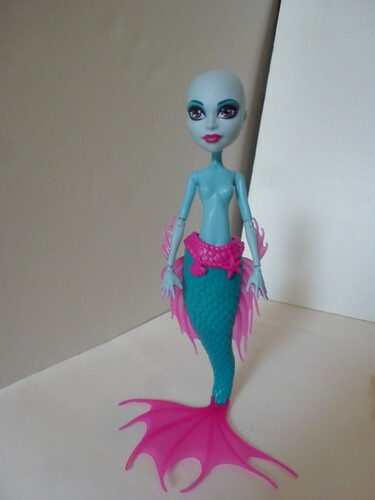 The Siren has a brand-new ear-shape and skin-tone, a little darker blue than Lagoona’s. 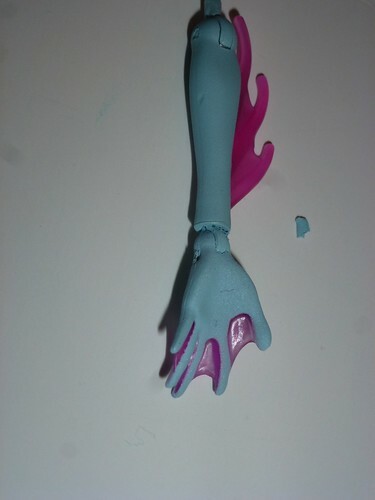 Her arms and hands are a clear pink plastic covered up by blue paint. The paint can sometimes be a little sloppy over the webs between her fingers, and the hands aren’t very easy to examine from outside the package. I was very alarmed when a chunk of blue paint flaked off as I inserted the hand into the wrist. It looks like it came off of the post or the inside of the socket, but it did make me want to be very careful with her limbs. I also feel like the plastic paint may have become a little dented from my fingernails, but I’m not certain. The Siren comes with two different belts, as well as a sleeveless top that has a stiff string sewn in to the top seam. 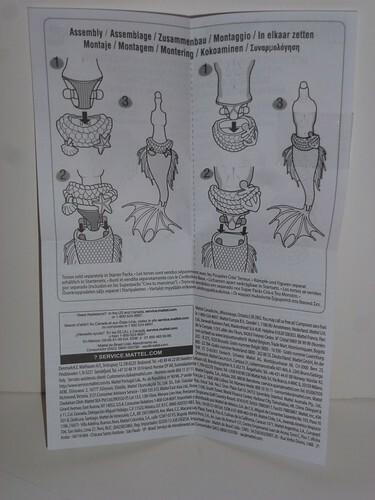 Funny story: I dutifully photographed this instruction set, and yet did not realize until some minutes later that the directions show the belts and tail being used with a female AND male torso! 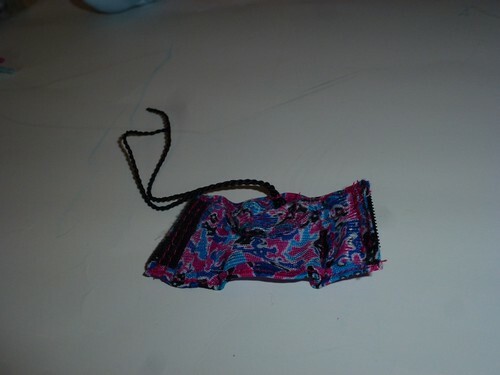 The blue belt is designed to let you use the male torso with the siren-tail. Whether or not you’d WANT to use the male torso with the siren-tail is a matter of personal taste. 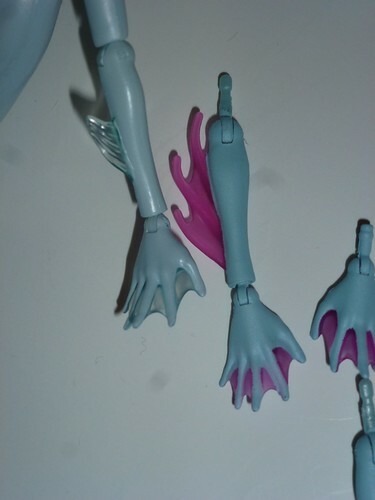 The siren-tail has an articulation point that lets the doll “stand up” on the tail. The belt has prongs on the inside that help fill in the gaps between the female torso and the siren-tail. 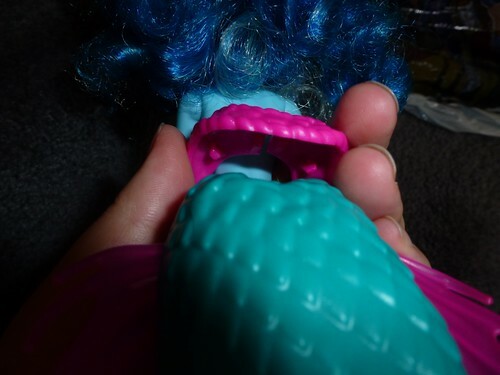 I ended up using the blue torso and upper arms from the Monster High Create a Monster 5-pack sold at Mattel’s online webstore in 2012. It’s not a perfect match, but I figure it’s close enough for now. 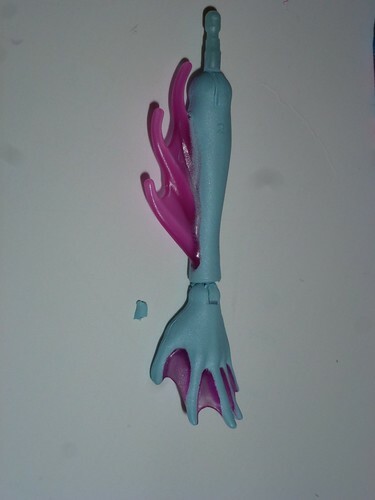 The translucent pink torso and arms from the Ice/Blob set should look pretty nice as well. 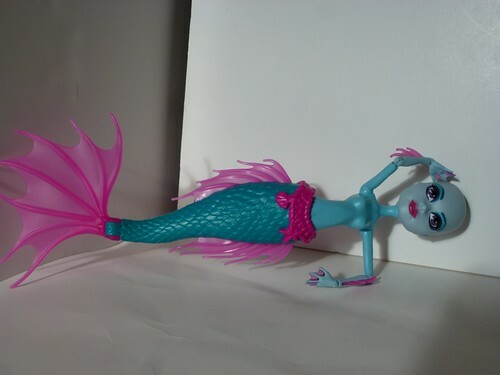 The asymmetrical shape of the siren-tail lets the doll pose as if swimming or sunning herself. 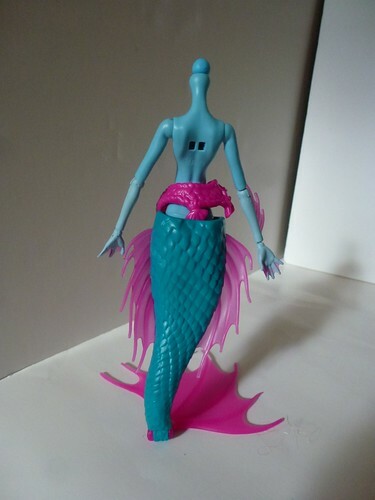 The bent tail definitely makes the Siren much shorter than the other Monster High dolls. She’s still pretty cute, though, and I love her elaborate fins. 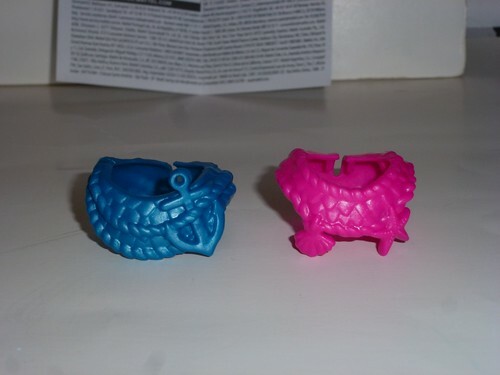 All in all, the Create a Monster Siren and Harpy are great additions to the Monster High family, and I’m very impressed that Mattel thought ahead and included option parts that made the siren-tail compatible with the male torsos as well as the female ones. Bravo!